It's my daughter's first day of school and the school bus arrived late! Nothing like a late bus to add to the back-to-school first day jitters. I'm sure, despite the start, she'll have a great day at school. She's familiar with her school and already knows a few of her classmates. We spent the early part of the week reading some school themed books to help get back into the school mindset. One of her favorites is about a funny dog named Bailey. Bark-to-school? "Try not to lick anyone today." That's good advice for someone attending school, particularly if that someone is a dog. 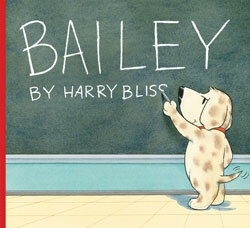 Harry Bliss' new book introduces young readers to Bailey, a cute dog that attends school with school children. Just like the regular kids, Bailey prepares for and spends an entire day at Champlain Elementary school. He picks out his apparel (a red dog collar), rides the bus (with his head out the window), shares some of his favorite things (garbage, YUCK! ), and paints and sings with the best of them. He even gives an impressive report on Fala, Franklin D. Roosevelt's dog. Bailey fits in at school and the kids treat him as an equal, even though he ruins their kickball game and eats garbage at lunch. Bliss' book is all about fun, nothing more, nothing less, and Bailey is an extremely likeable character. Any kid that has attended school will be able to identify with Bailey and will find a lot humor in the author's portrayal of an average school day. Bliss pulls from his comics background and uses speech balloons to accompany the easy-to read text, making the book perfect for beginning elementary readers. 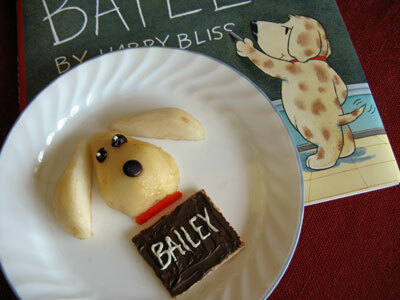 Preschool kids all the way up to early elementary age will enjoy reading about Bailey's day at school. Make sure to look closely at the illustrations, and you'll find even more things to smile about. 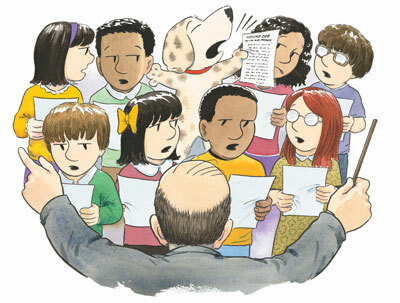 My kids think it is hilarious that Bailey loudly sings Elvis Presley's "Hound Dog" in music class and they request that I sing a rendition when I read the story aloud. Besides his work in the children's book world, Bliss is a cover artist for The New Yorker and also a cartoonist. His syndicated cartoon panel is titled "Bliss." In the Fall Picture Books Scholastic Librarian Preview video Bliss says that Schulz's Snoopy cartoon character is part of the inspiration behind his book about Bailey. It's easy to point out the similarities. Like Snoopy, Bailey never speaks but thought balloons clue the reader into what he is thinking. Both dogs wear a collar and have floppy ears. Unlike Snoopy, Bailey does not seem to have an owner and lives in a deluxe dog house. Coincidentally, Bliss' first children's book A Fine, Fine School (written by Sharon Creech) also briefly pictures a dog at school. Doesn't the illustration look almost exactly the same as the Bailey cover art? My daughter is always hungry after a day at school so I thought we'd make some fun treats inspired by Bliss' book. We made chalkboard graham crackers by spreading chocolate chips on top of a graham cracker. We wrote on our chalkboards by squeezing melted white chocolate out of the corner of a plastic bag. Our edible Bailey dog head is made out of a sliced pear, with blueberry craisins eyes, M&Ms nose, and a red pepper collar. Go Back To School with BAILEY! Scholastic has kindly offered to sponsor a special Bailey giveaway. To enter the contest, leave a comment related to this post or let me know the title your favorite school themed children's book. • Contest ends on Monday, September 19th, 2011 at 11:59 PM CST. What a cute book! My kids are huge fans of the "Magic Schoolbus" book series. My favorite school themed book is Librarian from the Black Lagoon. I sometimes read the book "First Graders Take A Test" to my high school students. It helps to remind them that we can't always make an A on a test. Sounds like a great book for kids, love that he hangs his head out the school bus window. I like If You Take a Mouse to School by Laura Numeroff. I just love back to school shopping...I always did! The book looks super cute and I would love to read it to my daughter. It is funny that Bailey eats his own homework. Your snack is very clever! I love it! One of my all-time favorite picture books is RUBY THE COPYCAT by Peggy Rathman. It's mostly set in the classroom, and I highly recommend it! But I'm eager to get to know Bailey, so thanks so much for the chance to win a copy! +1 I follow with GFC. I love Lilly's Purple Plastic Purse. I am a subscriber and I would love to win this! I like How Dinosaurs Go To School! Thanks for the great giveaway! this book looks so cute. My niece Bailey just started school and I would love to surprise her with this. This looks and sounds like a great book. Thanks for sharing your review of it. Yummy looking snack! How about IS YOUR BUFFALO READY FOR KINDERGARTEN? Cute book! I love the Magic School Bus books. But they don't have enough dogs in them! My favorite school themed book is First Day Jitters! This looks like a great story, thanks for the giveaway! Splat the Cat is one of our favorite school books. I love the Miss Malarkey books for anytime during the school year. Thanks!! I like Arthur, the aardvark! I loved Miss Nelson is Missing. I loved the dog snack- great idea! I love the Berenstain's Bears Back to School books! This looks like such a cute book. Junie B Jones is Dev's fave she is a riot reading it aloud to her nephew. The Teacher from the Black Lagoon is pretty good. Bailey looks like a character the little ones would love. I'm curious to read about his adventures myself. Garfield's Ironcat is a nice book. My granddaughter loves chapter books including Magic School Bus, Ivy and Bean, The Princess Academy/Tiara Club books are favorites. My favorite, FAVORITE school themed children's book will always be Magic School Bus. I loved the books as a kid , I love the show , and I still watched it before I had kids, as of know I can watch it on the sly with my kids :-). It will probably end up being one of the children's books My kids like the most. That and the David books. Our favorite books are the Bearinstein Bears!! Scholastic books are the best!